Wilbur Earl Hendrix, of Molino, FL went home to be with his Lord and Savior on Saturday, July 31, 2010 at the age of 76. Born on October 30, 1933, Wilbur was a life long resident of Molino. Wilbur is survived by his loving wife of 56 years, Carolyn; his son, Randy (Patty); his daughter, Anita Barnett (George); his grandchildren, Emily Williams (Paul), Miranda Sevcik (Ben), Chelsea, and Ashley Barnett, Asa Hendrix, Danielle Hare, Patrick, Andrew and Christopher Cooke; his great grandchildren, Madison, MacKenzie, Ryleigh and Baily Williams, and Kennedy and Jackson Sevick. A man of God and family, Wilbur will be remembered by those who knew him best as someone who worked with his hands his entire life. Wilbur was creative and inventive, able to find ingenious solutions, and could always be looked to when something needed repairing, even after his fingers and wrist had to be repaired. He was always willing to help anyone in need of finding a problem with automobiles, lawn mowers and equipment, even traveling strangers who needed help. He never turned his back on anyone who needed his help. Wilbur had a reputation in his community for demonstrating integrity and precision in all of his actions. He, along with four other Molino residents, organized and founded the Molino Volunteer Fire Department. Wilbur was elected Molino’s first fire chief and served in that position until 1970 when health problems forced him to step down from this role. In 1968, Wilbur and his wife Carolyn founded Hendrix Lawn and Cycle and Hendrix Service Center. Together they owned and operated this very successful community based business for over 38 years. Wilbur loved to travel and together he and Carolyn had the opportunity to travel to all 50 states, Canada and Prince Edward Island. Funeral service will be 2:00 p.m. Monday, August 2, 2010, at Highland Baptist Church with Rev. Brian Calhoun officiating. Interment will follow in the church cemetery. Faith Chapel Funeral Home North, 1000 Highway 29 Cantonment, is in charge of arrangements. The family will receive friends at Faith Chapel North from 4:30 until 7:00 p.m. on Sunday, August 1. In lieu of flowers, memorial contributions may be made to The Gideons Organization or to Covenant Hospice. James Grady “Jimbo” Johnson, 49, of Atmore died Thursday July 29, 2010, in Mobile. He was a market manager, born in Pensacola on June 10, 196, to Dudley V. and Betty Lou Lundford Johnson. Survivors include his wife, Beverly Ivey Johnson of Atmore; his parents, Dudley V. and Betty L. Johnson of Dothan; three sons, Nicholas Turner Johnson, James Cody Johnson, Charles Ethan Johnson, all of Atmore; one daughter, Amber Nichole Johnson of Atmore; two brothers, Charles Harold “Hal” Johnson of Dothan and Pat Conn of Atmore; three grandchildren, Matteson Nychole Johnson, James Grayden Johnson, and McKenna Sue Johnson; and may friends. Services will be Sunday August 01, 2010, at 2 p.m. from Johnson-Quimby Funeral Home Chapel with Rev. J.W. Ivey officiating. Interment will follow in Oak Hill Cemetery. Family received friends, Saturday evening July 31, 2010, at Johnson-Quimby Funeral Home. Johnson-Quimby Funeral Home, Inc. in charge of all arrangements. Charles Grover Everette, 79, of Atmore died Friday July 30, 2010, at his residence. He was retired, from Smith Tractor Co. as a part salesman, born in Escambia County, Alabama, on September 22, 1930, to the late Jessie Earl and Georgia Mae Turberville Everette, Sr. He was a member of the Brooks Memorial Baptist Church and a lifetime deacon, and a U.S. Army veteran. He is preceded in death by a son, Stephen Grover Everette. Survivors are his wife, Carolyn Kizer Everette; two sons, Richard Lee Everette and Michael Scott Everette; wife, Wanda; one daughter, Carolyn Denean Barnett and husband Wayne, all of Atmore; two brothers, Smith Everette and wife, Mable of Bay Minette; Gordon Everette and wife, Jettie of Atmore; one sister, Alma Miles of Atmore; seven grandchildren, Kerri Leigh Wilson of Ft. Polk, LA, Jessie Lee Everette of Ft. Braggs, NC., Niki Leigh Everette, Daryl Thomas Leto, Cody Scott Everette. Stephanie Marie Everette, and Carson Leah Barnett all of Atmore; two great-grandchildren, Kyleigh Everette and Jayla Wilson both of Ft. Polk, LA..
Services will be Monday August 2, 2010, at 10 a.m. from Johnson-Quimby Funeral Home Chapel with Bro. Hugh Long officiating. Interment will follow in Canoe Freewill Baptist Cemetery. Family will receive friends Sunday evening August 1, 2010, at Johnson-Quimby Funeral Home from 5 p.m. until 8 p.m.
Tonight: Isolated showers and thunderstorms before 1am. Partly cloudy, with a low around 76. West wind around 5 mph becoming calm. Chance of precipitation is 20%. Sunday: Partly sunny and hot, with a high near 102. Heat index values as high as 111. Calm wind becoming southeast around 5 mph. Sunday Night: Mostly cloudy, with a low around 77. South wind around 5 mph becoming calm. Monday: Isolated showers and thunderstorms. Sunny and hot, with a high near 100. Heat index values as high as 110. Calm wind becoming south around 5 mph. Chance of precipitation is 20%. Monday Night: Isolated showers and thunderstorms before 1am. Partly cloudy, with a low around 76. South wind around 5 mph becoming calm. Chance of precipitation is 20%. Tuesday: A 30 percent chance of showers and thunderstorms. Mostly sunny and hot, with a high near 97. Calm wind becoming south around 5 mph. Tuesday Night: A 20 percent chance of showers and thunderstorms before 11pm. Partly cloudy, with a low around 76. South wind around 5 mph becoming calm. Wednesday: A 40 percent chance of showers and thunderstorms. Mostly sunny and hot, with a high near 97. Calm wind becoming southeast around 5 mph. Wednesday Night: A 20 percent chance of showers and thunderstorms. Partly cloudy, with a low around 75. South wind around 5 mph. Thursday: A 40 percent chance of showers and thunderstorms. Partly cloudy, with a high near 96. Thursday Night: A 20 percent chance of showers and thunderstorms. Partly cloudy, with a low around 75. Friday: A 40 percent chance of showers and thunderstorms. Partly cloudy, with a high near 93. Friday Night: A 20 percent chance of showers and thunderstorms. Partly cloudy, with a low around 74. Saturday: A 30 percent chance of showers and thunderstorms. Partly cloudy, with a high near 94. The field of candidates is set for three seats on the Century Town Council, with no opposition for one incumbent. 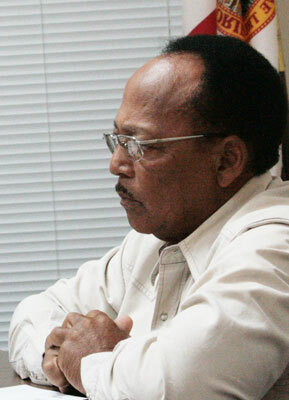 No one qualified to run against Seat 4 Councilman Gary Riley (pictured), putting him back in office for another term. Incumbent Henry Hawkins will face two opponents for the Century Town Council Seat 3 post. Jacke Johnston and Robert Lasher both qualified Friday for the position. Two candidates qualified for the Seat 5 job currently held by Sharon Scott who did not seek re-election. Candidates for Century Town Council Seat 5 are Sandra McMurray Jackson and Annie Carter Savage. Noon Friday was the deadline for Century candidates to qualify. The primary election for Century’s council is scheduled for October 5. The charter states that the primary election should be 30 days prior to the November election, but that date falls on Sunday, October 10. As a result, the date was moved to October 5. Per Florida statute, registration books will close on September 7 because September 6th is Labor Day. The general election/runoff is scheduled for November 9, the second Tuesday in November. Registration books will close on October 11. There will be one change for candidates this year for Century’s council. The Council has approved an ordinance that will require candidates to file their campaign finance disclosure statements electronically on the Internet as is done in other races in the county — as opposed to filling out a paper form. NorthEscambia.com file photo, click to enlarge. An arraignment date has been set for a Century caretaker accused of stealing from an elderly woman. Marialena Adams Godwin, 38, of Front Street, will be arraigned August 12 on a felony grand theft charge. Godwin allegedly stole a diamond ring and a pair of earrings from an elderly Century woman. Godwin was employed as the woman’s caretaker. 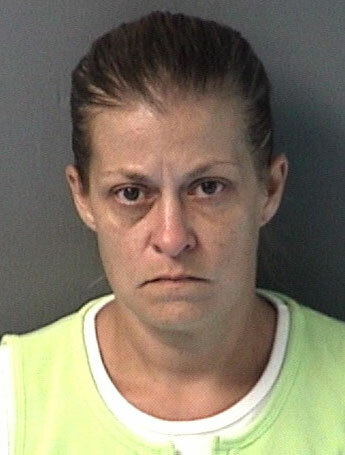 Godwin told Escambia County Sheriff’s Office investigators that she gave the jewelry to another woman as payment on debt. The jewelry was recovered and returned to the elderly woman. Godwin, who is free from jail on $2,500 bond, is scheduled to be arraigned in Escambia County Circuit Court on August 12 before Judge Frank Bell. If you are looking for some good, low cost shopping, consider the Junior Humane Society’s Thrift Store in Cantonment. Store proceeds benefit JHS activities, such as finding homes for homeless cats and dogs. The store features of clothing for all ages, shoes, office furniture, kitchen supplies, books, toys, pet supplies and other items with new merchandise arriving almost daily. Initially open just four days a week, hours have been expanded to include everyday except Sunday from 10 a.m. to 4 p.m. 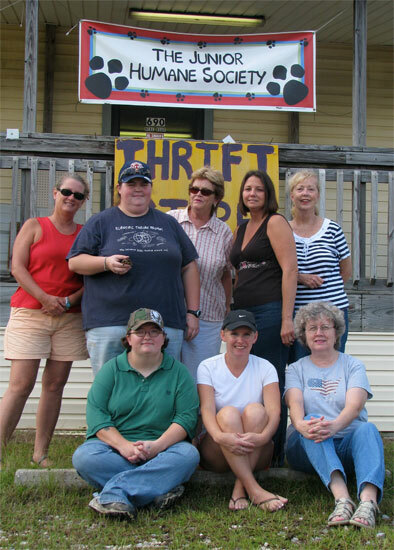 The store opened for business October 2009 after weeks of planning and hard work by a group of pet-minded and dedicated volunteers. Through the store, JHS volunteers have found a way to help the animals they care about so much and the community at the same time. The Junior Humane Society’s Thrift Store in Cantonment is located at the corner of Highway 29 and Neal Road in Cantonment. Pictured JHS volunteers Kristi Kirby; Amanda Gifford; Crystal Clanton; Mary Foster; Director Frankie Van Horn Harris; Christa Pettijohn; Elizabeth Irby; and Janet Lewis. Submitted photo for NorthEscambia.com, click to enlarge. Gulf Power Company’s power plants are humming around the clock to meet higher customer demands for electricity as temperatures soar across Northwest Florida. The company can generate 2,659 megawatts of electricity on its own and purchase more electricity if necessary from neighboring utilities. The peak demand for Wednesday was 2,477 megawatts and Gulf Power’s all-time peak was 2,634 megawatts set in August 2007. The utility is not expecting to set a new all-time peak this summer, but forecasts predict that Gulf Power will surpass Wednesday’s peak today and again early next week. Gulf Power’s customer service representatives work with customers who may have trouble paying for their electricity. The company offers a program called Budget Billing that helps smooth out seasonal changes in a customer’s electricity bill. An upcoming pile burner course will teach area residents how to burn piles legally, safely and efficiently. When the weather is dry, certified pile burners will receive priority for authorization to burn. Also, certified pile burners are allowed to burn up to two hours longer per day and get multiple day authorizations. Florida Division of Forestry and University of Florida will offer a certified pile burner course on Wednesday, August 18 from 8:30 a.m. to 4:30 p.m. at the Escambia County Extension Office, 3740 Stefani Road in Cantonment. Attendance is limited to 50; the cost is $50. To pre-register, or for more information, call Libbie Johnson at (850) 475-5230, visit escambia.ifas.ufl.edu or email libbiej@ufl.edu. Registration will take place today for Northwest Escambia football at Ernest Ward Middle School from 10 a.m. until noon. The cost is $70 for the first child, $35 for the second child and free for additional children in the same family. Teams are available for children 5 to 13 years old. Birth certificates and social security cards are needed for each child for registration.